It is an obvious one, but ask yourself what your motivations are for relocating. Is it the career opportunity, to change your lifestyle or to gain international skills and experience? 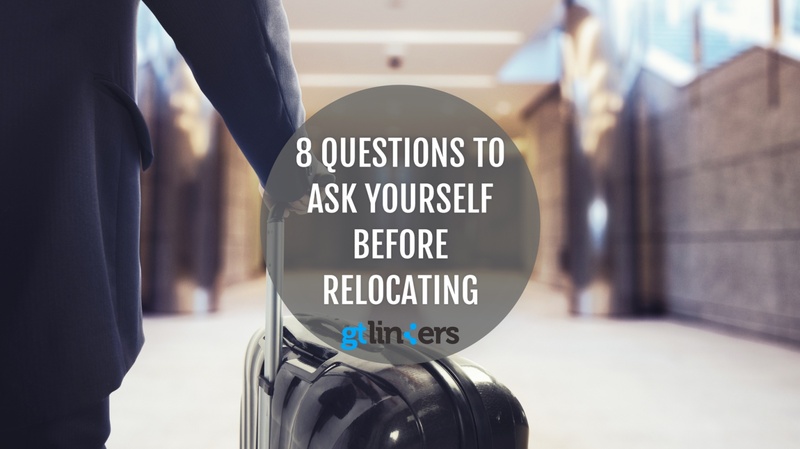 Whatever the reason, identifying your objectives for relocating can help you decide whether the opportunity will help you meet them or not. Have you done your homework on the job? The company? The city? It is one thing doing your homework on a potential new employer or job role, but when you could be relocating, it requires extensive research. The more you know about the job, company and city, the more easily you can imagine yourself relocating there or not. Ask informed questions, join forums, and even visit the city to find out about as much as you can before making a decision. At GT Linkers we offer complete relocation guides as part of our added value for our candidates. Where are your skills needed? If you are looking for an international opportunity yourself and have not yet been offered a job, you must find out where your skills could be needed. Research the job market in different areas; make a shortlist of destinations where there is demand for your skills and go from there. Who is paying for your moving expenses? Sending your belongings worldwide can be costly. Company policies on relocation allowances will vary, so understand your negotiation position and bargain diplomatically. Find out if there is a relocation package offered or what support your new employer will offer to help you settle in. Benefits for new employees are usually offered, however if not, we recommend assessing the cost-benefit of the move to weigh up the career opportunities with the financial cost. A common mistake people make when relocating is the assumption that a larger salary means a more prosperous life. Not always true. Cost of living fluctuates immensely between cities and even more so from one country to another. Crunch the numbers. We suggest using www.Numbeo.com as a tool for comparing the cost of living in different cities to give yourself a good sense of expenses from daily items to average rental prices and education. What else is important to you besides money? Other than a higher salary or a lower cost of living, what else can this opportunity offer you and what else is important to consider before deciding to move? Do you have children? Are there job opportunities for your spouse? Discuss it with all those affected by the move – children, parents, and your partner. Think about the quality of life in a new city by assessing things like education systems, health care, weather and how often you might want to travel back. Are there any cultural differences you should be aware of? Will you have to learn a new language? Are there cultural differences or local customs that you need to learn about? It may be the perfect city but if you don’t speak the local language, could this affect your standard of living? Listen to your gut! Are you second-guessing the move a lot? Well then you probably aren´t fully convinced by it. Or can you not stop thinking about opportunities there? And get excited at the prospect of an international challenge? Well then you should follow your gut and go for it! Either way you should be honest with yourself when answering all the above questions to make sure you make the right decision and for the right reason. Ready to relocate? Apply online for GT Linkers to help lunch your career globally and check out our international job opportunities!